Ellis Library and Reference Center , 3700 South Custer Rd, Monroe, MI 48161-9716- Ellis is now an LDS affiliate. LDS films can be ordered through their website and viewed in the library. Local History Indexes on Ellis Library website- includes a new index to service men and women in WW2. Lots of great resources for Monroe history and genealogy! Old Mill- Dundee, Michigan- Great resource for local history. Be sure to check out their NEW obituary index! Archives of Michigan, 702 W. Kalamazoo Street, Lansing, MI- now has Saturday hours!! Library of Michigan, 702 W. Kalamazoo Street, Lansing, MI- Beginning January 9, 2016, the main library will be open every Saturday (excluding certain state holidays) from 10 a.m. to 4 p.m.! Detroit Public Library - Check out the Burton Historical Collection and the huge photo collection on-line. WorldCat, World's Largest Library Catalog! Monroe County, MI Obit Index A new address for the obit index! Be sure to update your bookmarks! IHM Sisters- Very nice biographies, be sure to scroll down to see previous years' obits (2012-2017). Toledo Blade Obit Index- 1837 to present- Newly updated!! Tecumseh News- 1912-1914. Several issues of the Tecumseh papers have articles about Dundee and Cone residents. Well worth checking out. Copies of the articles from these papers are on file in GSMC's archives. Detroit Gazette - 1817- 1830. Several mentions of Monroe County in these papers! Transcribed church records of Monroe County- available in book form at Ellis, Monroe Historical Museum and GSMC's archives. Several Monroe County Church ledgers have been transcribed/translated and are available for research in Ellis Library, some are also available in the Monroe Historical Museum, and GSMC's archives. Trinity Lutheran Church (1830's-1921)- transcribed and translated from original German by Margarette Miller. Zion/St. Paul Lutheran Church (1848 - 1910)- transcribed and translated from original German by L. Dunham. Evangelical Lutheran Emmanuel Church aka Pear Tree Church (1856-1878)- transcribed and translated from original German by L. Dunham. St. Paul Lutheran Church, Maybee (1860-1930)-transcribed and translated from original German. Holy Ghost Lutheran (1846-1939)- transcribed and translated from original German. Probate Records Estate files 3-2460 (1811-1870) digitized copies are on line - on FamilySearch.org. These films are also available at the Archives of Michigan in Lansing. Copies are 20 cents/page. Ancestry recently added digitized probate records of Michigan to their collection. These include the probate files for Monroe County to about 1878 (the index is in our newsletters in April 1992- Aug 1993 issues). Probate Search - The search covers only 1988 to current. The Probate Court has transferred many of the Monroe County probate files to the Archives of Michigan in Lansing. Access to the probate records may be restricted if the material contains references to adoptions which is defined as confidential information by the State Court Administrator’s Office (SCAO). If restricted, researchers will need to make a research request to the Archives of Michigan for a search. In reviewing the records, staff found that indexes, calendars, and journals often contain mention of adoptions. If such references are present, the material will be restricted. The indexes from Monroe County Probate Court are restricted as they include adoptions, but the case files on microfilm will not be restricted as they do not have adoptions in them. In order to cover staff time, the fee for an index search will be $10.00. Researchers will also be able to make a research request for the case file only if they already have the case number for a fee of $30. Researchers can also make a research request for both an index search and case file copy for a fee of $40. The Archives of Michigan has lowered the current price for a probate record request and a-la-carte options to ease the burden on those placing remote requests. List of Probate Records Tranferred to Archives in Lansing. 1812 Pension File Search - Surnames starting with A - P are complete for Michigan (and other states). News on 1812 Pension Digitization- Thanks to Nancy Taylor! A new Chapter of Daughters of 1812 is organizing in Southeast Michigan/ Monroe County. The chapter is being named for Captain Philip R. Toll, who served in War of 1812 and is buried in Monroe. The organizing president is Mrs. Darla Lewis of Adrian. One of the purposes of this society is to preserve our heritage, historical sites, and to honor and record the burial sites of those who fought in the War of 1812. For more information on being a part of this new chapter contact: Mrs. Lewis, Judy Bargeon, or Lucy Pitcher. The web site of the National Society of Daughters of 1812 is www.usdaughters1812.org. For information on qualifications, see attached file. Civil War Research - a list of sites to check for your Civil War soldiers. Brown Books- a digital copy! Monroe County Civil War Fallen- list of casualties of Civil War who were born or resided in Monroe County. Names in red were added to list after monument names were submitted. Courthouse directory - Great resource for all things Monroe County Courthouse, including a history of the building, when the courthouse burned, and what records were affected. Birth, Marriage & Death Records have been transcribed by GSMC from the Monroe County Courthouse records and copies of our books containing these transcriptions are available for purchase from GSMC or can be viewed in our archives, the Monroe Historical Museum, Ellis Reference Library, and Bedford Library. Births and deaths begin in 1867, Marriages in 1818. Researchers can visit the County Clerk's office in the Monroe County Courthouse M, T, Th, or F from 8:30 am - 5:00 pm (Closed from 12:00-1:00 pm.) See the County's website for details on cost of copies and any record limitations. seekingmichigan- Death certificates for entire State of Michigan 1897-1952. Certificates for 1897 to 1941 are available to search and print. The certificates for 1942 are being loaded this month and should be completed in a few weeks. Some may not be available as they are loading, so please be patient. If you are having troubles printing a death certificate, try downloading it and printing it from a paint program. You can also crop out the black border, saving some ink/toner. Use Chrome as your browser rather than Explorer! If you can't find the name you are searching, try switching N and U (e.g. Branchean or Braucheau) or search on the date and place only. Names are NOT required in the search! And many names are misspelled. Michigan Death Records- Gendis- Check here for the early deaths in our county, not all were recorded in the county ledger, some were sent directly to the state! The list can also be found in our August 2015- Feb 2016 newsletters. Michigan Death Certificate Index 1921-1952- Information from Michigan death certificates on familysearch.org. Seekingmichigan will be adding images for the 1942 death certificates to their site in the near future! Ida Deaths 1924- Several of the deaths that occurred in Ida Twp in 1924 were not recorded in the county courthouse, but were sent directly to Lansing. See attached list for the records missing from the Monroe County Courthouse for Ida Twp. Wayne County Death Indexes- 1934-1953 (not City of Detroit). Searchable through Ancestry also. Historical Collections- Collections and Researches made by Michigan Pioneer and Historical Society Vol 1 - 15 Link to the first 15 volumes of the Michigan Pioneer books. Great resource for 1880's and 1890's Michigan history. Digitized volumes are 1877- 1906. Historical Collections- Collections and Researches made by Michigan Pioneer and Historical Society Vol 16 - 30 Link to more volumes of the Michigan Pioneer books. Great resource for 1880's and 1890's Michigan history. 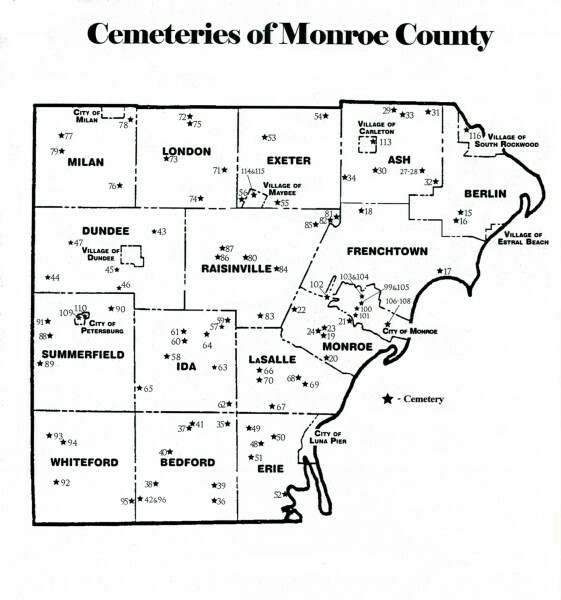 Map of Monroe County Cemeteries - Numbers on cemeteries below correlate to this map. Michigan County Histories and Atlases - The Michigan County Histories and Atlases Digitization Project is comprised of 428 digitized titles (many composed of multiple volumes) published before 1923. The collection offers all members of the community free keyword searching and page-by-page access to digitized reproductions of Michigan county histories and atlases as a resource for historical and genealogical research. Map of Langensteinbach, Baden 1758- Many Monroe County German families originated from this town in Baden, Germany. Cemeteries - Links directly to Find A Grave for each cemetery. Several of these cemeteries have full transcriptions available on our website (for members) under Record Transcriptions. The numbers correspond with the cemetery map of the county. 31. Evergreen Cemetery (See Port Creek Evergreen Cemetery). 81. Gethsemane Cemetery - across the street from Holy Ghost Church in Raisinville Twp. 84. King Cemetery aka Sackett Cemetery- most graves in this cemetery are on Find A Grave! Full transcription available. 44. Leib Cemetery Photos of markers in Leib are available here. Full transcription available. Twp Cemetery in Find-A-Grave listings. Find A Grave. Transcription in process to be posted on website soon! now! Those without markers are from the twp burial permits. Full transcription available. McCormick Cemetery- Located on Doty Road just south of Blue Bush Road in Exeter Twp. Cemetery, located in Raisinville Twp. Full transcription available. markers for anyone in this cemetery! 90. Pleasant View Cemetery Full transcription available. 31. Port Creek Evergreen Cemetery (aka Evergreen Cemetery)- Full transcription in process! Cemetery page on left menu. 87. Rath Cemetery - next to Prince of Peace Cemetery, originally owned by the Rath family. 63. Richardson Cemetery - Full transcription available. All markers on Find A Grave. searched using a cadaver sniffing dog. No remains were found. 56. St. Paul's Lutheran - on Stone Road in Maybee. Full transcription available. 96. Whiteford Union Cemetery (aka Whiteford Cemetery) Lambertville, MI. Index to deeds and deeds digitized on FamilySearch. All books are digitized now!! Note: you must now log in to view records on FamilySearch! Bureau of Land Office Records -live access to Federal land conveyance records for the Public Land States, including image access to more than five million Federal land title records issued between 1820 and the present. 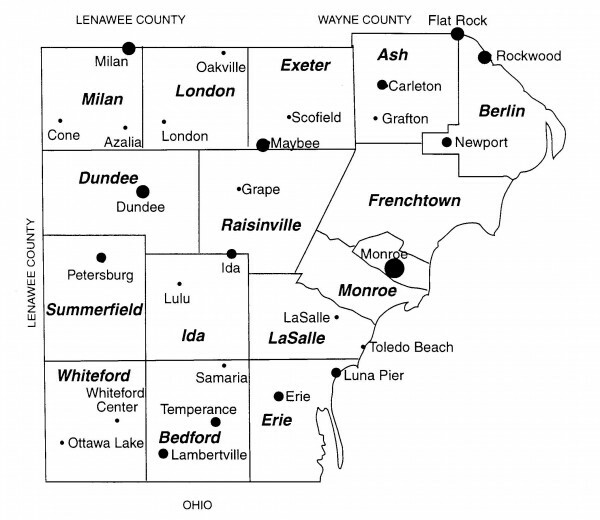 Land Record Definitions- thanks to Don Adams (and Dave Rekuc for scanning) for providing the definitions and explanations of land records for Monroe County and Michigan. Navarre Lime Book Index - compiled by Cliff Venier- Joseph G Navarre (1803-1862) was a member of a prominent early Monroe family. His “lime” book is an account book for his business transaction for the periods 1835-1838 and 1846-1853. His business in 1835 involved calcining limestone to make lime, which was used to neutralize soil to increase yields in agriculture. Although the original purpose was to record lime “burns”, the book quickly became both a business account book and a journal of significant events. One interesting historical note: the amounts of accounts were often calculated in “bits”, one-eighth of a dollar (hence, a quarter is two bits). The symbol for bit was /. The database records about 1000 entries, many of which are multiple entries for the same person. For example, there are five entries for George Custer in early 1849, and 55 for Abraham Chenever in the 1850s. Historic Monroe site Contains much history of Monroe and the people who reside there. ​Monroe County Wikipedia Page- lots of great info and links to other info. Michigan Historical Society Centennial Farm Program- the place to go for information on how to apply for a centennial farm in the State of Michigan. Monroe Memories- Information on the history of Monroe County, MI. Dearborn Museum -has some local church records on microfilm. Open Tuesdays 10-4 or by appointment. Michigan Genealogical Council - Great source for latest happenings in Michigan genealogical resources and events. Yargerville- the former post office is located on the corner of Minx and Wood Roads on the border of LaSalle & Ida Twps.